Farming? Domestication of animals? Transportation? OK, what about something a little more fundamental like utilities? Water, electricity, telephone and so on. Things so taken for granted in developed countries that we barely give them a second’s thought. How about something actually appropriate to my subject; The Internet itself? Not only weren’t any of these things perfect when first introduced, they still aren’t. Not by a long shot, and nor will they ever be. So why are we expecting more from the Internet of Things? As a security expert, I cannot imagine anything more horrifying than billions of connected devices built almost entirely for function. Where race to market is the primary motivator because any competitive advantage is all but gone in a matter of days. And security, if it was even considered during development, was only done so perfunctorily, and likely with a fair degree of annoyance. Having more time. Or perhaps more to the point; making betteruse of the time I have left. Everyone talks about the risks and the inevitable disasters related to IoT, because that’s what sells column inches (like this recent event). Or they talk about increased efficiency, convenience, and quality of life because that’s what sells products. But what it all boils down to is this; What price do we have to pay for more time? How much of our privacy, or even our physical safety are we prepared to put at risk for a better life? A life spent doing the things we want to do, not the things we have to do just to get by. Unfortunately, in our society, we are being allowed to accept less and less responsibility for our actions. From ‘Caution, Contents Hot’ labels on our coffee cups, to political correctness, to affirmative action, we are completely devolving accountability for our own lives to external entities. This must stop. When it comes to the Internet of Things, we must make our own choices, and we absolutely must accept the consequences. It does not matter how many regulations and standards the Government puts into place, the IoT will always be far from perfect. Bad people WILL make bad things happen. Should organisations be held liable for gross negligence? Of course. Does that help the person whose pacemaker was hacked through their iPhone? No, it doesn’t. ‘Educated consumer’ is right up there with ‘religious tolerance’ in being a perfect oxymoron. But educated consumers is exactly what we all need to be. We now have a lot of control about how much of our identity is available online. Again, it’s not perfect, but with account insurance, regulatory compliance and such, the rewards from our online functionality far outweigh the risks. But what happens when everything from the front door to the contents of our cupboards is available in the Internet? 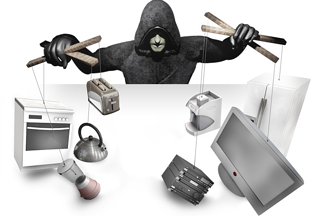 When every appliance, every utility, our location, health, finances, are all just a hack away? Will the amazing convenience that can be achieved outsourcing ‘control’ of those things be worth the risk of total loss? Only you can make that choice, and you cannot point fingers at anyone else if things go wrong. There is no recourse open to you, and the only defence you have is to educate yourself. Start by assuming that everything you put online can be lost in its entirety. Are you prepared for that, because it’s not an exaggeration?